Oh my freakin’ Jeebus, people! I’m so pissed and annoyed and… plain freaked out, it’s not funny. You know how we on the left always wonder just how crazy the Republicans and Bush-Cheney Corporate Headquarters are? Well, wonder no more! Poland and the United States struck a deal Thursday that will strengthen military ties and put an American missile interceptor base in Poland, a plan that has infuriated Moscow and sparked fears in Europe of a new arms race. ”We have crossed the Rubicon,” Polish Prime Minister Donald Tusk said, referring to U.S. consent to Poland’s demands after more than 18 months of negotiations. Washington says the planned system, which is not yet operational, is needed to protect the U.S. and Europe from possible attacks by missile-armed ”rogue states” like Iran. The Kremlin, however, feels it is aimed at Russia’s missile force and warns it will worsen tensions. 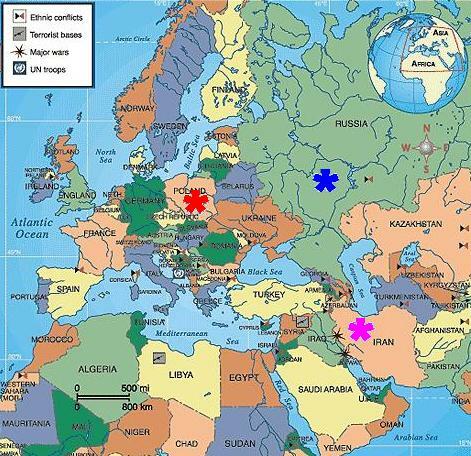 Red - Poland; Blue - Russia; Fuschia - Iran. but… um… just ignore that. U.S. officials also said the timing of the deal was not meant to antagonize Russian leaders at a time when relations already are strained over the recent fighting between Russia and Georgia over the South Ossetia region. “O hai! Sry, dudez. Srsly! That clause appeared to be a direct reference to Russia, which has threatened to aim its nuclear-armed missiles at Poland — a former Soviet satellite — if it hosts the U.S. site. Ummm… is anyone else having flashbacks to the 1980s and The Day After ? Dr. Landowska: There is a rumor that they are evacuating Moscow. There are people even leaving Kansas City because of the missile base. Now I ask you: To where does one go from Kansas City? The Yukon? Tahiti? We are not talking about Hiroshima anymore. Hiroshima was… was peanuts! Dr. Russell Oakes: What’s going on? Do you have any idea what’s going on in this world? Dr. Landowska: Yeah. Stupidity… has a habit of getting its way. Yep, and this misAdministration isn’t going to be happy until the whole freakin’ world is in flames. Poisoning their brainwashed minds, oh lord yeah! Wait till their judgement day comes, yeah! In Part II of the Dog and Pony show held at the House Armed Services Committee, we learned that freedom and democracy are pretty hard to force down the throats of an occupied people. September 2007 – Violence is up; we must stay. April 2008 – Violence was down, but it seems to be going up again; we must stay. September 2007 – There have been improvements, but we must stay to see the surge through. April 2008 – The surge brought improvements, and some troops have left, but we must “pause” the draw-downs – which will leave more troops in Iraq than there was before the surge – and stay to see it through. Hmmm…. Anyone else reminded of the theme song from the Shari Lewis/Lambchop show? I also learned that “victory” in Iraq will consist of a country “at peace with itself and its neighbors”, able to defend itself, with a “reasonably representative” government that can care for its citizens. Yeah, mull that over for a bit. Not one country in the Middle East could meet those standards, and neither could the US. Canada, maybe. So the shorter Petraeus: We’re never leaving. In other news: El Pollo Loco will announce a reduction in combat tour lengths, to twelve months. This change will not go into effect until August, and will not apply to troops currently serving in Iraq and Afghanistan. This speech was delivered the night before his assassination. The power of it was, and remains, incredible. Each time I’ve heard it, I feel a thrill in my heart – and a terrible chill down my spine. As others have wondered, I too wonder if he didn’t know or have some inkling of what was to come. Perhaps he knew – not that he would die very soon – but that his power, the power of his words and his actions, the power and strength of the movement as a whole, was becoming too great for those who opposed equality, and so – eventually – they would find a way and he was reconciled to that. Perhaps he was simply at peace with death, because death could not hurt him; it could only unite him with the Lord he served. On April 4, 1967, one year before his death, the Rev. Dr. Martin Luther King, Jr. spoke out against the war in Vietnam. His speech, entitled “Beyond Vietnam: A Time to Break Silence” remains one of his least known speeches, though it is gaining more visibility as the war in Iraq drags on, especially now that it’s been added to YouTube. I was lucky enough to grow up in a family that believed in equality for all people long before it was socially acceptable. My grandmother treated everyone as equals far before it was the right thing in the eyes of society or the law. In fact, in her early years, that was considered the wrong thing to do, even the “un-Christian” thing, because segregation and oppression of other races was “God’s will” for the white “superior” race. My mother was thirteen when Dr. King stood at the Lincoln Memorial and told the world about his dream, almost eighteen when he was killed in April 1968. She listened to his words, felt their impact all the way to her soul as a result of her mother’s example, and over the years has tried with every fiber of her being to help that dream become reality. Some people grew up with pictures of Jesus or the saints or a president in their living rooms; we had Dr. King. Today, I believe we are striving ever closer to the day when that dream is a reality. But it is not here, and it won’t be until each of us plays our part. We must teach and inform and – most importantly – act on our belief that each and everyone of us is an equal member of the human race regardless of our color, our gender, our orientation, our ethnic background, our religious persuasions, our nationalities, or any of the millions of other ways in which every human being is different from every other. Now how many people must get killed? For oil families pockets to get filled? How many oil families get killed? Not a damn one so what’s the deal? You think it’s democracy they’re fighting for? My mother cried the day John Lennon died. When I asked her why she was crying – after all, this wasn’t a relative, a friend, a coworker – she repeated the lyrics of “Imagine” from memory. The idea that this beautiful, gifted, gentle, poetic soul — who protested against a war and spoke up for harmony and peace and love for all people, no matter who they are, or where they were, or what their political beliefs — should die in a sudden act of violence was stunning. And heartbreaking. When I speak out against the war and against the abuses of government, when I speak out to raise awareness of the suffering of the Iraqi people or to rage at those who have failed – over and over again – to provide our military with the proper training and equipment, and then fail them and their families again by failing to ensure they have proper medical care if they’re wounded, who leave the poor even poorer and the rich even richer, I do so because I believe. I dream. When I do any or all of those things, it is because I imagine a far better world, and I believe we can attain a world without violence, without hatred of those who are different, without poverty. And I have my mother to thank for teaching me to believe in that dream. Like it, love it, hate it? Sound off in the comments or Email Me! 10 Things About Me |… on Cool News! Is YOUR Mascot a Racial Stereotype? Commenting Notice: Because spammers are getting faster in finding workarounds to my spam filter, I'm now moderating all comments containing links. If your comment doesn't show up right away, it's caught in the filter and will be released at some point - usually within 24 hours.